This is one of our most popular cottages, which together with its neighbouring cottage the Dairy was also a former milking parlour. 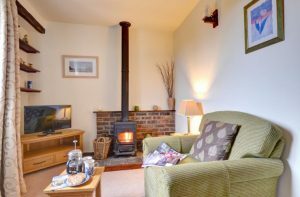 The cottage has a porch area for outdoor clothing, a fully equipped modern kitchen with an electric halogen hob cooker, microwave, fridge-freezer box together with utensils, toaster and kettle, cafeteria and dining table. 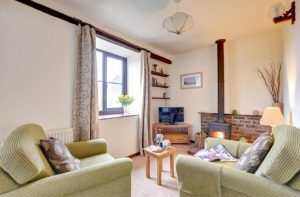 Off the kitchen is a cosy living room with original beams and a Danish Morso wood burning stove as well as central heating. 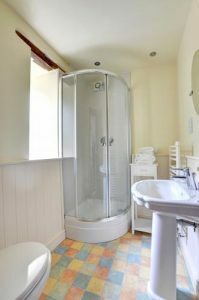 There is a double bedroom with en-suite bathroom, which contains a shower and heated towel rail. 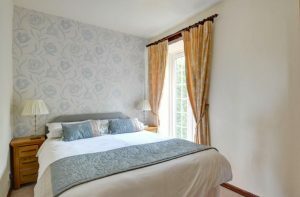 All your linen and towels are provided and beds are made up prior to arrival. 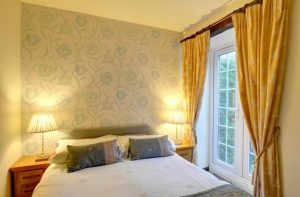 From the bedroom you have French doors leading to a south facing patio with sitting out area. 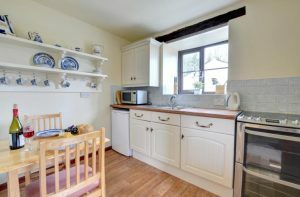 Like The Dairy the view from the elevated position allows stunning views across Parc Newydd lakes and open countryside beyond which can be enjoyed both from the cottage or the additional private seating area to the front of the cottage.